With an idyllic waterfront location, on the Island of Alameda, near Oakland and San Francisco City, the inn offers a fusion of tranquility with easy access to business and recreational activities. The enchanting waterfront property offers breathtaking views of the yacht harbor, the Bay, and the Oakland Hills from private room balconies, ideal for romantic breaks, family adventures and business meetings. During the day you can relax by the outdoor heated pool, or walk along the shoreline jogging and bike path. Sailing and boating are also offered at the nearby marina. Alternatively you can visit downtown Oakland or the beautiful San Francisco City. FROM OAKLAND AIRPORT / SAN JOSE : Come north on 880 and take the Downtown Oakland / Broadway exit. Turn left and a very sharp left again to enter the Webster Tube. FROM SAN FRANCISCO - Take the Bay Bridge and from 580 take 980 towards Downtown Oakland. Take the 12th Street exit; go straight, turn left on 5th Street . Cross Broadway and turn left into the Webster Tube. Turn left on Atlantic Avenue and left again on Triumph Drive . 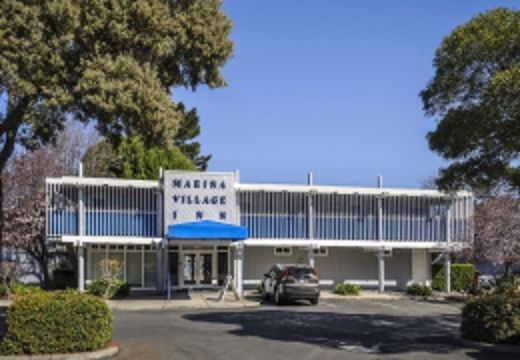 The Marina Village Inn is located at the end of Triumph Drive, between the Oakland and Encinal Yacht Clubs. War weary, lunar germ-exposed, haunted aircraft carrier is open for tours. In the art installation "Urge," a mechanized skeleton man atop an Earth globe will sit or stand at the whims of certain onlookers. A naturally musical sculpture created from pieces of an old cemetery. Juts out on a jetty in San Francisco bay. National Park visitor center includes exhibits and films on WWII home front jobs for women and minorities, the shipbuilding prowess of Richmond, the strain on facilities, and social fabric, and the unsinkable propaganda poster gal Rosie.